Guillaume De Ridder is the 2018 RallyX Nordic presented by Cooper Tires Supercar Lites Champion after doing exactly what he needed to wrap up the title before at the end of Q3. The Belgian came into the final weekend of the season at the Tierp Arena with a comfortable 17 point margin over Ben-Philip Gundersen, but while he couldn’t manage more than third overall in the Intermediate Classification, his rivals was only fourth himself. As such, De Ridder extended his lead to 18 points ahead of the semi-finals and with only 14 points up for grabs in the final races of the season it means the Olsbergs MSE driver has an insurmountable lead. 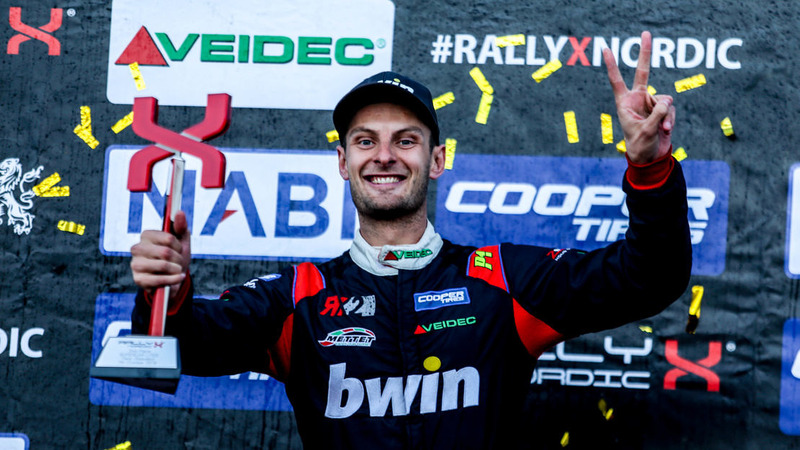 De Ridder made his RallyX Nordic debut this season with the Swedish team as part of a campaign alongside the RX2 International Series and immediately made an impression by winning the opening three races. While issues in Nysum and Kouvola pegged him back to bring the championship down to the wire, it was a tall order for his one remaining rival in Gundersen to keep his hopes alive into the final. Series returnee Kevin Eriksson won the Intermediate Classification in the sister Olsbergs MSE car, with newcomer Reinis Nitiss impressing to claim second on his maiden Supercar Lites outing. De Ridder was third with Gundersen fourth, ahead of Sondre Evjen in fifth. Meanwhile, Jonathan Walfridsson is reported to be OK by JC Raceteknik after a heavy crash in race two of Q3 prompted a red flag.